Larry Norman kept every single missive, letter, handwritten note, scribbling and confession that his friends sent to him over the past fifty years. Poring over Larry’s immense archives of correspondence with Randy has been simultaneously revelatory, eye-opening, disconcerting, and clarifying, often within a single letter. In addition to all the letters from Randy to Larry, the archival filing cabinets also contain all of Randy’s correspondence with Sarah Stonehill during the years they were married, letters written during and after their divorce, and all of the legal documents and divorce papers that ended Randy and Sarah’s marriage, including the true reasons why the marriage ended. As an example of how extensive the archives are, I’ve included here part of the very first letter that Randy Stonehill ever wrote to Larry Norman. Scribbled on the back of an air-sickness bag on his flight home from his initial visit to Larry’s Los Angeles bungalow in 1969, here are the ramblings of a young Randy Stonehill trying to contain the newly found zeal that is coursing through his teenage head… It’s not strictly germane to the purpose of this web site, but I’ve included it because I think it will be of interest to fans of Larry and Randy, and also illustrate the extent of the Solid Rock archives. Click for JPEG. 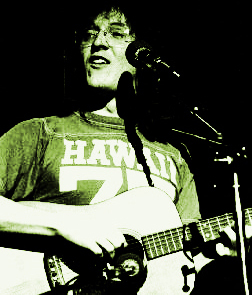 Where does one begin when attempting to write about Randy Stonehill and his behavior over the years? A complete report on Randy’s letters and actions over the years is beyond the scope of this website, but many of these documents will be scanned and posted here over the next couple of months. Some are not very flattering to Mr. Stonehill, but then, Randy speaks plainly in the Fallen Angel movie about the importance of making the truth known. In one part of the movie Randy Stonehill says “I respect him enough to actually tell his truth.” In this website I will be actually telling the truth about Randy Stonehill through his own letters and statements backed up with documentation rather than empty words. The Fallen Angel movie implies that Randy Stonehill’s wife Sarah had an affair with Larry. 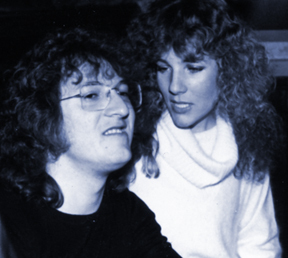 August 2, 1975 – Randy Stonehill and Sarah Finch are married at the First Congregational Church, Los Angeles. Click for PDF or JPEG. “dressed up for me instead of for Debbie B… you would have kissed me instead of (L. M. – name obscured) or Sandy. You would have had a crush on me instead of (D.P – name obscured)” Click here for a PDF or JPEG excerpt from this letter. The entire letter won’t be shown here because of privacy issues that would be embarrassing to innocent third parties. 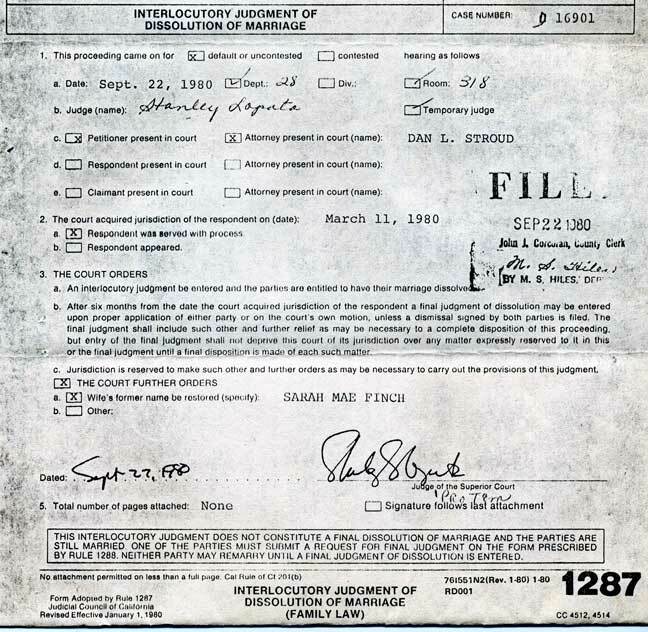 SEPTEMBER 22, 1980 –An Interlocutory Judgment of Dissolution of Marriage is filed: Click here for PDF or JPEG. Just weeks after Randy and Sarah’s divorce is final, Randy marries his girlfriend Sandi. Larry turns down an invitation to their wedding and instead writes Randy a letter expressing his disappointment that Randy would leave Sarah and marry another woman. This event triggers the beginning of the end of the friendship between Randy Stonehill and Larry Norman. The incident is referred to in a letter Larry wrote to Randy years later. Click for PDF or JPEG. In this same letter, Randy goes on to state that he believed that his remarriage was the right thing to do and that it wasn’t a rash act, even though it must have looked that way to everyone. He also says that he is very happy in his new marriage. Click here for PDF of this very telling letter. October 28, 1982 – After six months of hearing accusations around the world that Larry had an affair with Sarah while she and Randy were married, Larry and Sarah contacted Randy and Sandi Stonehill and confronted them about the rumors. Sandi wrote a reply to Sarah in which she stated that she and Randy had also heard the same “silly gossip and rumors” and that she thought that people must be coming to their own conclusions since Larry and Randy no longer worked together and that Larry and Sarah’s relationship must be the reason why. Sandi goes on to call this a totally unfair assessment by people who merely “want to gossip and talk.” Click here for PDF or JPEG. Perhaps someone can ask Randy point blank if Larry and Sarah had an affair the next time he appears live on stage for a “Q & A session” at a showing of this film. In fact, I have a whole list of questions for Stonehill and Di Sabatino. If you can attend a showing, please email me on the feedback page and I’ll send you a list of questions to ask them just in case I can’t get all of mine answered at the “premier” in Nashville. UPDATE: March 21, 2010 – Randy Stonehill announced on his Facebook page that he was divorcing Sandi, his wife of thirty years. Sandi posted on her Facebook page that she felt “blindsided once again” by Randy not informing her that he was going to publicly announce the divorce in such a way. Sandi, to her great credit, has engaged me in conversation even knowing that I am a long time friend of Larry Norman. Some of the other participants in Fallen Angel stopped communicating with me as soon as they found out that I am friends with the Normans. These are but a few of the letters and messages that will be posted here over the next few months as time allows. Why in the world would Randy Stonehill appear in a movie that casts false innuendo and tries to destroy the legacy of a brother in Christ who is no longer around to defend himself? I think Randy should make a public statement admitting what he has done. When I tried to contact him through his manager, Ray Ware, my personal correspondence was forwarded to David Di Sabatino instead. The common perception of Randy is that he was a young artist who naively signed a contract with Larry that was “unfair and one-sided.” In the movie Randy tells a sob story about Larry and how he got Randy to sign over his publishing. In reality, Randy was not a naive artist. He went over his contracts with a fine-toothed comb and made notes questioning various clauses and contractual points. Here is an example of one such contract from the mid 1970s, with Randy’s notes for alterations to be made in the final draft: Click for PDF or JPEG. At some point in their career, almost every artist wishes they hadn’t signed away their publishing. This is usually when they are economically stable with a steady income and at a stage where they wouldn’t need to assign their copyrights to a music publisher in return for help with their career. Randy is no exception. In the early 80s he decided he wanted Larry to give him his publishing back. Larry wasn’t convinced. The reason Larry was skeptical is best explained in a letter written by Larry to Randy in November of 1998. It’s a lengthy (11 page) letter that covers a lot of the problems in Larry and Randy’s relationship over the years. The matter of publishing is discussed on pages 3 and 4. Portions of the letter have been blacked out, largely to protect the innocent, and because some of the “anecdotes” concerning Randy described within aren’t suitable for this web site. Here is the letter in PDF format. Randy surmises in the movie that eventually Larry handed over all of Randy’s publishing, and reunited with him in concert after 22 years because Larry was lonely and tired of the friction between them. The truth is that Larry was tired of hearing from promoters and others around the world that Randy was still telling stories about him after two decades. So Larry decided to give Randy his publishing on the condition that Randy would stop making disparaging statements about him. This stipulation was written into the contract which Randy agreed to and quickly signed. One of the most amusing parts of the Fallen Angel film occurs when Randy discusses Larry’s appearance onstage with him at Cornerstone 2001. Randy implies that it was some sort of publicity stunt on Larry’s part to help his own image and career. It’s difficult to not laugh at this scene in the movie where Randy thinks back ponderously on this event. The truth is that Larry didn’t need any publicity to aid his “waning career” and Randy knows it. Larry was one of the top draw headliners on the main stage of the festival on Saturday night, while Randy was relegated to performing in a small tent opening for the Sweet Comfort Band on the previous Thursday. Click for PDF or JPEG.